B.VPN is an excellent and powerful VPN service provider based in Netherlands. It is easy to use and you can set up and install this B.VPN into your device like computer, Mac, Android, iOS and Linux. it provides easy installation instructions for customers with one single click to connect VPN applications. B.VPN uses the unbreakable encryption AES-256 encryption to protect and encrypt all internet traffic of users. No one can access your internet traffic and other personal information. therefore, this B.VPN is praised to be one of the most trusted and strongest VPN provider not only for personal use but also fit for business use. Customers can use this B.VPN in different devices and systems including Windows, Mac, Android, iOS and Linux. anyway, it is compatible with all devices and smartphone, tablets. You are allowed to connect up to 6 different devices with one same B.VPN account at the same time. that means it allows 6 simultaneous connections. This number is enough for most people and family use. Besides, B.VPN is also equipped with multiple strong VPN protocols including OpenVPN, SSH, Smoke and L2TP to add more layers of security for personal security and privacy online. That’s one of the reason why people like to choose use this B.VPN service from all around the world. like other reliable and big VPN service provider, this B.VPN also practices strict Non-logging policy which means your online activities and browsing history and other personal data will not and never be logged by B.VPN service provider. You can keep private on the internet with this B.VPN service. and B.VPN can give you complete security and protect your personal sensitive all the time. even though you are using the unsecured WiFi hotspot in public place like café. B.VPN has a WiFi/Hotspot protection feature which aims at protecting users’ personal sensitive information from hackers while using public WiFi hotspot. B.VPN expands their network with 26 servers in 14 locations and countries. it can offer customer fast and smooth connection speed. you even can use it to stream favorite movies with fast speed. 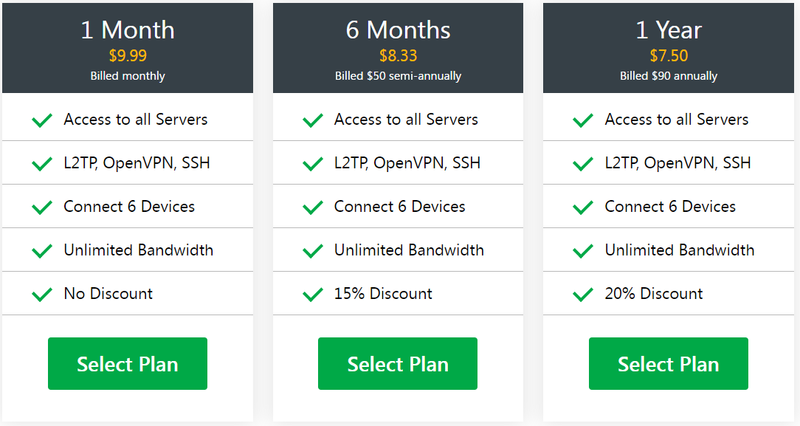 As B.VPN describing, B.VPN always provides 3 different packages and pricing for personal and business use. All their packages can guarantee fast speed without any restrictions or speed limitation. There is no traffic usage and no bandwidth limitation. What’s B.VPN always give the irresistible discounts for different packages. You can choose your favorite package to subscribe and sign up. What device does B.VPN support? You can use easy-to-use and intuitive B.VPN software and apps in many devices and platform based on all major and popular systems including Windows, Mac, iOS, Android, Linux, Chromium, routers. it also supports other platforms including Apple TV, Playstation and XBOX. You can use B.VPN in these devices for fast speed or accessing other websites. If you like to play games, you can also set up this B.VPN into games consoles like PlayStation 3 and Xbox, as well as Apple TV and DD-WRT router. 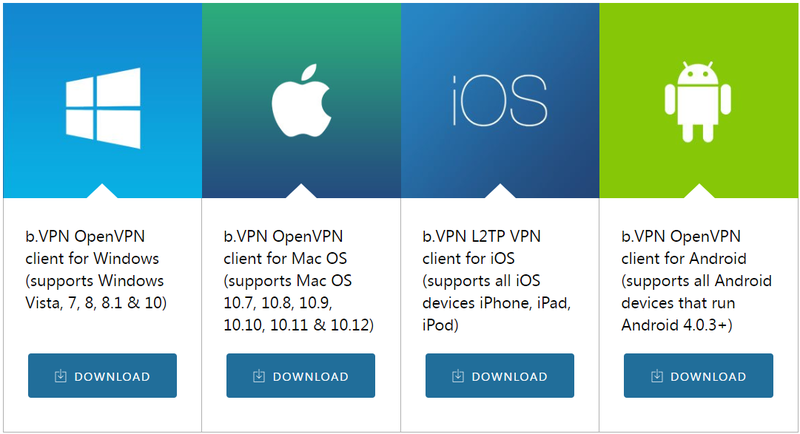 B.VPN support multiple different devices and platforms. That’s why many people prefer choosing this VPN service. and meanwhile, it allows 6 simultaneous connections. You can connect one same B.VPN account on up to 6 different devices at the same time. you can use this B.VPN to access any blocked websites and apps quickly. There is no problem streaming videos and movies from Netflix, BBC iPlayer, Hulu, HBO GO, Showtimes and other platforms. B.VPN provides different clients app for different devices based on different systems. If you want to install and set up B.VPN in Windows computer desktop or laptop like Win 10, 8, 7, and Vista, it will support OpenVPN click for these different Windows version. B.VPN OpenVPN click also works with Mac OS system including Mac OS 10.7, 10.8, 10.9, 10.10, 10.11 & 10.12; for iOS device like iPhone and iPad, B.VPN support L2TP VPN client; for android device, it supports OpenVPN client. What device you use will be set up in different clients. You also can get detailed instructions to set up your B.VPN in your device. B.VPN provides a medium size networking with over 26 servers in over 14 countries: USA, Canada, UK, Australia, Germany, France, Netherlands, Saudi Arabia, Sweden, Russia, India, Singapore, Japan, and Ukraine. Although B.VPN does not provide as many servers and locations as other big VPN provides like ExpressVPN, NordVPN, PureVPN and others, it does offer the necessary servers in popular locations like United States, Canada, United Kingdom, Australia and France. So actually it is useful enough for people who does not require so many locations. You can still use this B.VPN to stream all popular service like Netflix, Hulu, BBC iPlayer, HBO GO and others from anywhere as B.VPN provides ultra-fast VPN servers in United States and United Kingdom. And whatever packages you purchase from B.VPN, you can still connect to these locations and servers, as all packages include all these servers and locations. B.VPN is an ideal and excellent VPN tool for individuals and business use. Many personal and business companies choose to use this B.VPN to protect their information and help access any blocked websites from anywhere. If you are always on vacation or business trip abroad, this B.VPN is the best fit, as it offers all popular servers and locations in popular and important locations like USA and UK. Your staff can access any websites and contacts their team and partners anytime and anywhere. B.VPN actually increase the business productivity and efficiency and meanwhile, it increase the online security and privacy for your business data and confidential information. Like other reliable and strong VPN service providers, B.VPN also has a strict No logging policy. That means it does and never log customers online browsing history, collect customer’s online activities or spy on what customers do on the internet. they never do a metadata retention from customers. however, your account number and email should be kept by B.VPN for the purpose of problem diagnose. If your server connection has any problem, they will give you a timely email to notify you immediately. unlike your ISP, B.VPN never and will never log any data about VPN server usage and traffic usage. They never share any data with any partied, government and other organizations for profitable purpose. B.VPN also take users’ privacy and security online seriously. Therefore, you can use this B.VPN service with total ease. Don’t worry if the B.VPN staff will spy on what you do on the internet and collect your information. they never spy on user’s privacy. Since now more and more internet users pay more attention to their online privacy and security, B.VPN also take privacy and security more seriously, and meanwhile, it takes different measures to protect users from hackers and cyber criminals. Your personal sensitive information will not be stolen by anyone online, as B.VPN also uses the strongest encryption method called AES-256 key which is an unbreakable encryption method. all your internet traffic and data will be completely protected by this encrypted tunnel. What B.VPN is Usually Used for? VPN tool is usually a tool to help internet users to protect their online personal information and data, and currently more and more internet users require a higher level of online security and privacy. So, B.VPN is used by internet users for online security and privacy. B.VPN is also an important tool to help people circumvent internet censorship and geo-restrictions to access their favorite websites and service. therefore, B.VPN or other VPN tools is usually used for online security, privacy, freedom, anonymity and accessing favorite websites from anywhere and anytime. These are all main functions and abilities a VPN should possesses. When you come to select VPN tool on the internet, you should first avoid free VPN, as free VPN would not offer fast and stable speed, and even has not ability to keep your private and secure on the internet as it uses the weak technologies and features. Free VPN even will be filtered by strong and sophisticated internet censorship, and Free VPN has no ability to access internet-censored websites. If you use the Free VPN to stream your favorite movies or videos, it may leak your personal information and original identity and locations. It is not secure to use Free VPN. The Free VPN providers even can collect your personal information and share with others even sell to third parties for profitable purpose. It is wise and secure to choose Paid VPN service with strong and reliable features and technologies like B.VPN. Usually when we surf on the internet, we don’t wish anyone can monitor or spy on what we do on the internet. we don’t want our personal information to be leaked out for any reason. And we don’t want to be hacked by remote hackers or hacker’s virus, Trojan, malware and other online attacks. All these purposes and wishes indicate that we want to be more private, anonymous and secure while browsing on the internet. VPN tool like B.VPN is specifically created to keep private, anonymous and secure online for internet users. However, if you are not using a VPN, all your internet traffic will first just go through your ISP’s servers, and your ISP can read and view your internet traffic and collect other personal information. once your information and other data is collected, your information would be in a risk that it will be transferred to other parties and government, as ISP should abide by some laws and regulation about internet censorship from government. they are authorized by government to collect user’s information and do metadata retention legally. However, we never wish our privacy would be leaked and read by others like ISP and government. if you use VPN tool, the VPN like B.VPN will protect and encrypt all your internet traffic with Aes-256 key. And all your internet traffic will just go through between your devices and the servers you connect to. The most important thing is that AES-256 is the military-grade encryption which is always used to encrypt data and information. no one can access or decrypt this unbreakable AES-256 key, even the fastest computer has no way to break this encryption. So, once you run strong VPN like B.VPN on your device, all your internet traffic will just travel through an encrypted tunnel between devices and the servers provided by B.VPN over your public network. Even though you are connecting to unsecured public network like free WiFi hotspot in café, airport, hospital, bank, restaurant and supermarket, you are still protected by B.VPN tool. B.VPN has a WiFi hotspot protection which can activate automatically when it detects that you are using and connection public Wifi Hotspot. It can protect all your data and information. plus, the B.VPN has a strong encryption method, so hackers and snoopers in WiFi Hotspot will not be able to access your data and other information at all. identity theft will not happen on your device at all. therefore, it is wise to use VPN tool. Besides, the VPN changes your original IP address and replace with other new IP address by the server you connect. Then you can surf on the internet anonymously without telling others your real IP address and location. Other people will just see the new IP address and don’t know your real location and identity. In this way, you can browse online anonymously as B.VPN hides your real IP address and location. Your real identity will not be known by anyone. Therefore, VPN is a great tool to help people get anonymity on the internet. Unblocking websites is one of the most important functions that one VPN should possesses. This is also one of the most important why people use a VPN tool. Some websites and apps are not allowed to access due to internet censorship or geo-restrictions. Internet censorship is created by the local government. and geo-restriction is usually used by the websites to limit people in certain location to access and use their website’s service. internet censorship is practiced by government to control and limit what and where people can browse, discuss and publish on the internet. Countries like China, Russia, UAE, India, Pakistan, Turkey, Iran, Syria etc are implementing internet censorship to protect their domestic internet security. and many websites are not allowed to access in this countries and locations. Internet censorship in different countries has the same purpose to mainly block foreign social media, social networking, messaging, photo sharing and news websites and apps. Take China for example, China practices the strongest and most sophisticated internet censorship in the world to control what websites can be accessed. In China, you will find social media and other websites like Facebook, Twitter, YouTube, Instagram, LINE, Snapchat, WhatsApp, Viber, the New York Times, Flickr and other are blocked completely by the strictest internet censorship – the Great Firewall of China. And this GFW system always keeps upgrading to become stronger. What’s more, China mainland applies strong anti-VPN and practices different laws and regulations to control and limit VPN usage. Once your weak-performance VPN is detected by the Anti-VPN tools, your VPN will be soon filtered. In China, you should use the strong VPN tool like B.VPN to access any internet-censored websites. Geo-blocking or geo-restrictions is other big barrier to block people access certain websites. Geo-restriction or Geo-blocking is a method that companies & websites use to make sure that only people in a specific geographic location are able to access a certain site or service. those websites using geo-restrictions usually can recognize where you geographically are by checking your device’s IP address, because an IP address can be used to determine a computer’s geographical location with reasonable accuracy. For example, if you are trying to access Netflix from China, the Netflix websites will first detect your IP address and then knows your real location from China, then it will soon block your access immediately. to successfully access the geo-blocking websites is to alter or hide your real IP address, and then your real identity will not be found by the websites. VPN like B.VPN can help you solve this blocking website issues. B.VPN can defeat internet censorship and bypass the geo-blocking restrictions completely and help users to access the websites they need. First, B.VPN is equipped with a strong and advanced technology called SMOKE protocol which is mainly used to defeat internet censorship like the Great Firewall of China. 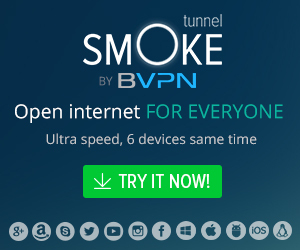 What SMOKE does is that it makes sure that VPN connection cannot be identified by DPI, while maintaining connection stability and speed with dynamic changes to tunnel behaviors’. B.VPN users can now enjoy unrestricted access to open Internet without worries about being tracked down, throttled, constantly disconnected. B.VPN changes your IP address and replaces with a new IP address assigned from the server you connect to. Then you can mask your real identity and location, then you can access the websites blocked by geo-restrictions. That is how a B.VPN can help Access Internet-censored and Geo-blocking websites Anywhere. It is wonderful to use this B.VPN to stream such popular services as Netflix, BBC iPlayer, Hulu, HBO Go, Amazon prime Video, Pandora, Spotify and more in HD. B.VPN cloaks your real IP address and replace it with a new IP address assigned by server you connect. Changing IP address can help mask your real Identity and location, then you can get complete online anonymity and access any websites without any restriction. And meanwhile, your ISP will not be able to monitor what you do on the internet and collect your browsing history. B.VPN mainly strengthens their USA and UK VPN, as almost internet users must connect to USA and UK server for popular websites and streaming service like Facebook, Twitter, Youtube, Instagram, LINE, Snapchat, WhatsApp, Flickr, Netflix, Hulu, BBC iPlayer, Amazon Prime Video and more. once you use this B.VPN tool, all your online activities like browsing, messaging, VoIP sessions, emails and so on will not be able to monitored or tracked by the ISP or government or other third party. In this way, B.VPN increase more security and privacy for users. Besides, you also can enjoy complete fast connection speed., as B.VPN applies sophisticated and complex compression technologies and techniques to speed up your internet connection. and B.VPN encrypts all your internet traffic data before it is sent out to the internet. B.VPN protects your internet traffic and helps access any websites blocked by internet censorship or geo-blocking restrictions from anywhere and anytime without lag. You also can enjoy advanced features provided by B.VPN like OpenVPN, L2TP, OpenVPN/SSH, PPTP and Wi-Fi/Hotspot protection. B.VPN is a trusted and reliable VPN service. You should give it a try.